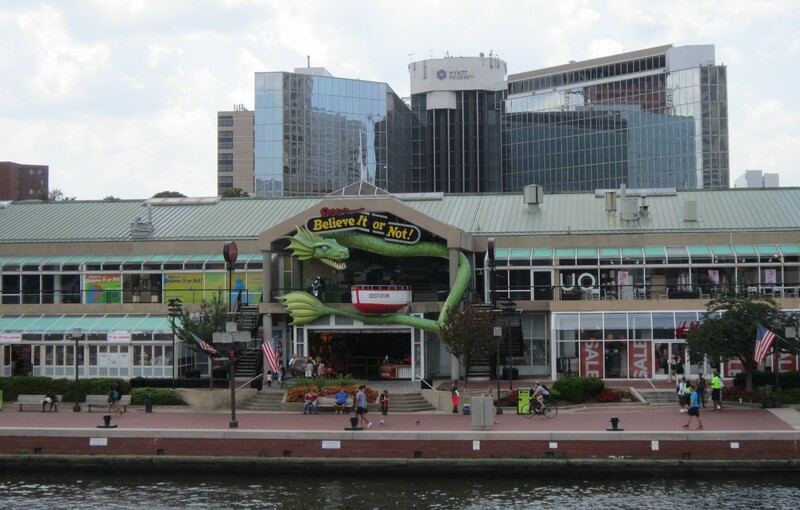 Our 2017 Road Trip, Part 35: Farewell, Inner Harbor « Midlife Crisis Crossover! 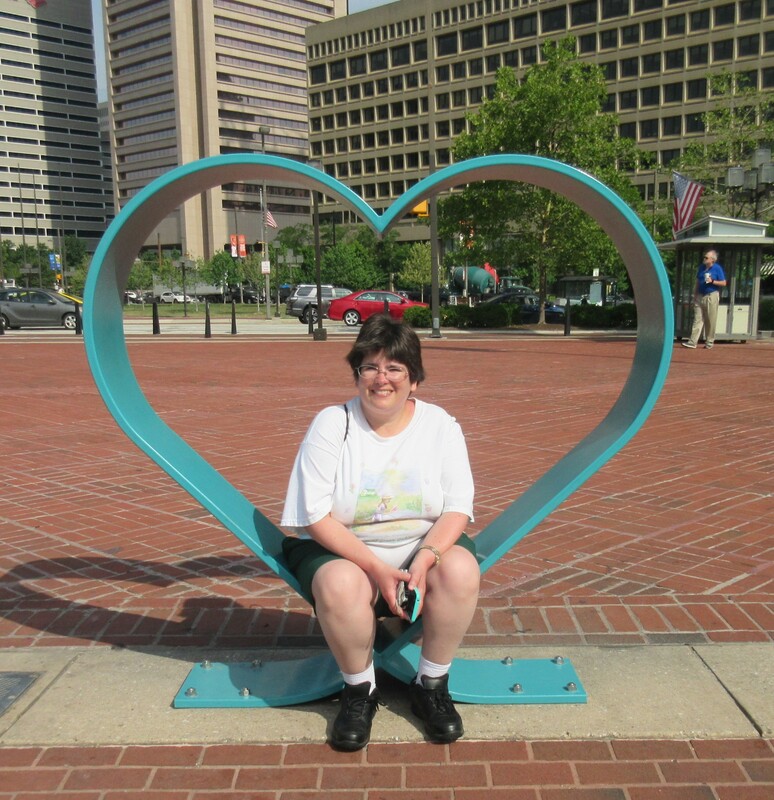 This steel heart was part of a 2016 project involving a Baltimore “Code of Respect”. It had fine-print behavior rules on top for all Inner Harbor pedestrians to read and take to heart (see what they did there? ), but we missed that part. After three full days in Baltimore (plus our late arrival on Day Two), on the morning of Day Six it was time for us to move on and begin the long journey home. But before we recount those miles and the attractions along the way, here’s one last look back at some of our traipsing around Baltimore’s Inner Harbor, that fun waterside nexus where we saw museums, rode water taxis, smashed pennies, enjoyed quality meals, stepped on boats of varying historic significance, encountered panhandlers, started our sunburns, hit my head three times on a submarine ceiling, and saw Old Bay seasoning sold in larger quantities than any family outside Maryland should ever need in their entire lifetimes. On the south shore between nice housing and yachts was the Rusty Scupper, one of the renowned restaurants we missed. We were just never near that section at any given mealtime. 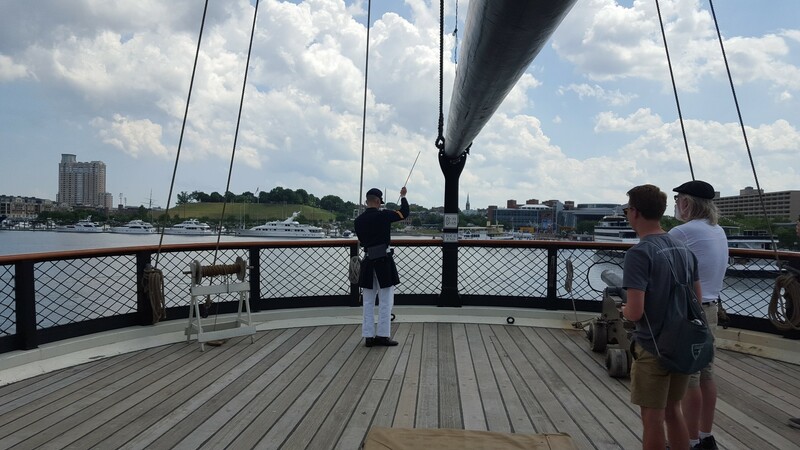 On the deck of the USS Constellation, watching our tour guide demonstrate old-time rifle shooting before I paused and pivoted to video. 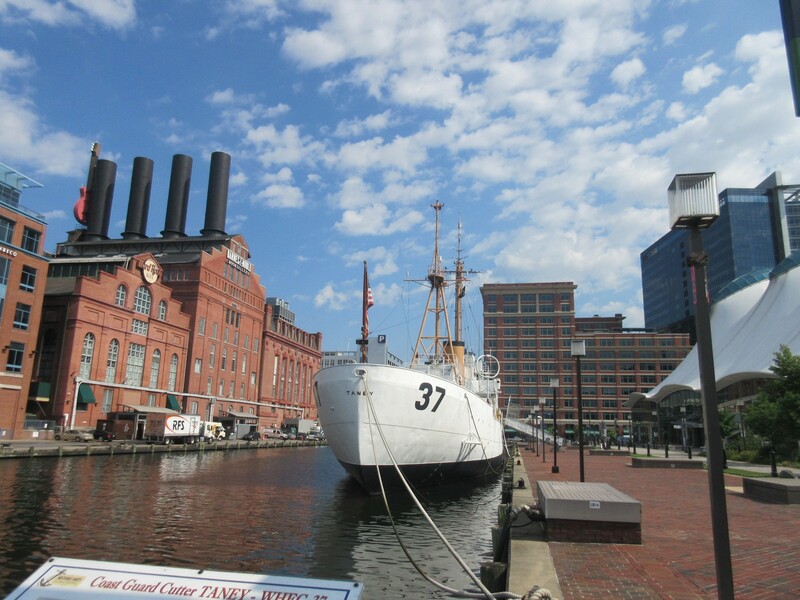 Head-on at the USCGC Taney, and our best view of all four smokestacks atop the repurposed Barnes & Noble. 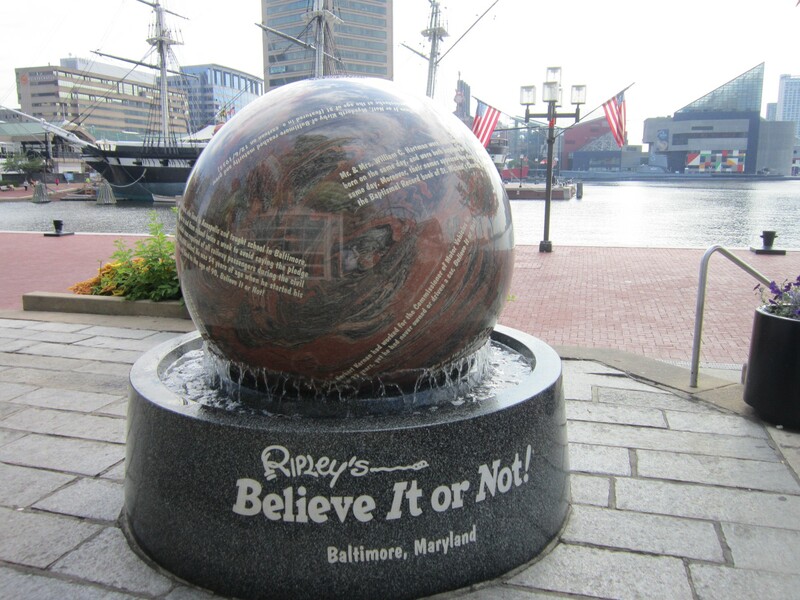 The Harborplace’s Light Street Pavilion and its garish centerpiece, a Ripley’s Believe It Or Not! Museum. 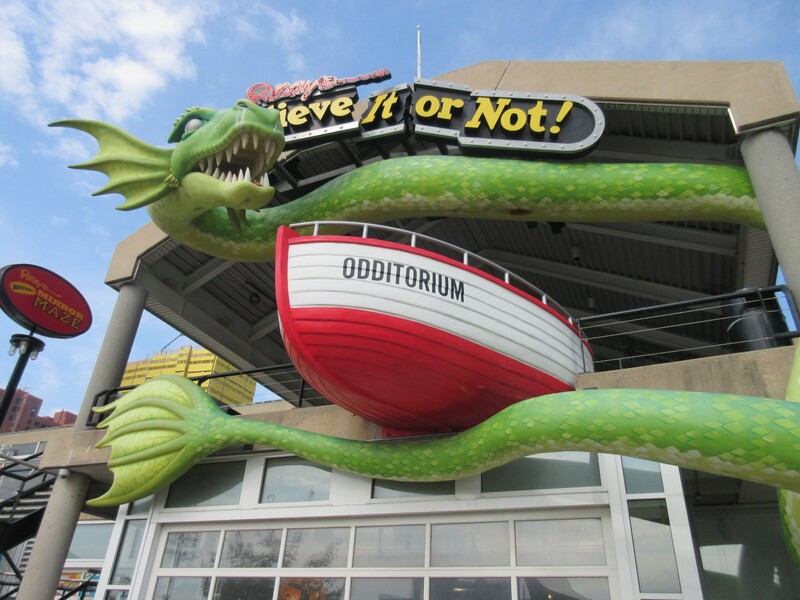 We’ve previously spotted Ripley’s locations on the Canadian side of Niagara Falls, across the street from the Alamo (the one time we ever gave them money), in cheesy Wisconsin Dells, and in otherwise historic St. Augustine. 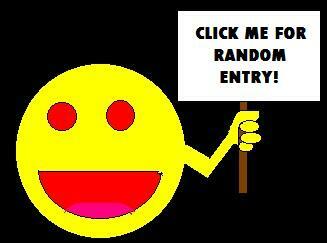 Their presence screams “tourist trap” every time. Sometimes Ripley’s can be educational. Kindasorta. Technically. Barely. 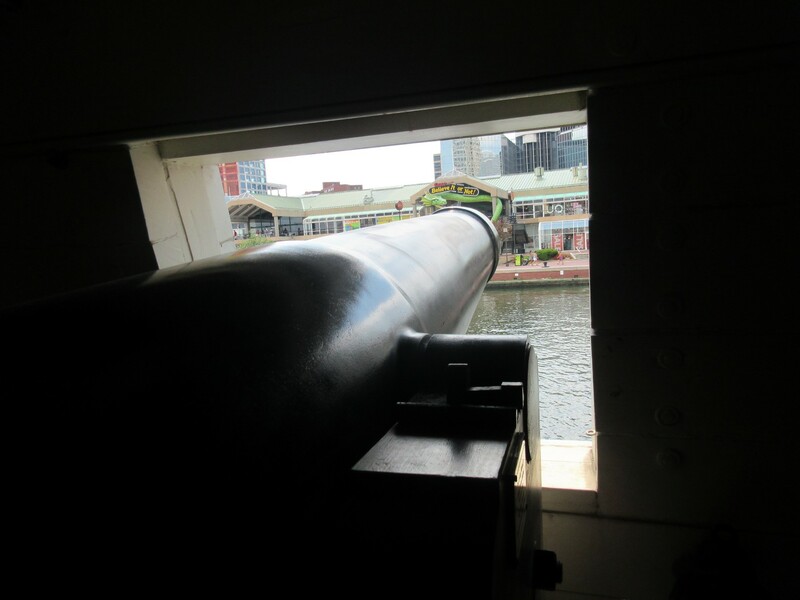 Alternatively, you can view their Inner Harbor franchise down the barrel of a Constellation cannon and play make-believe. 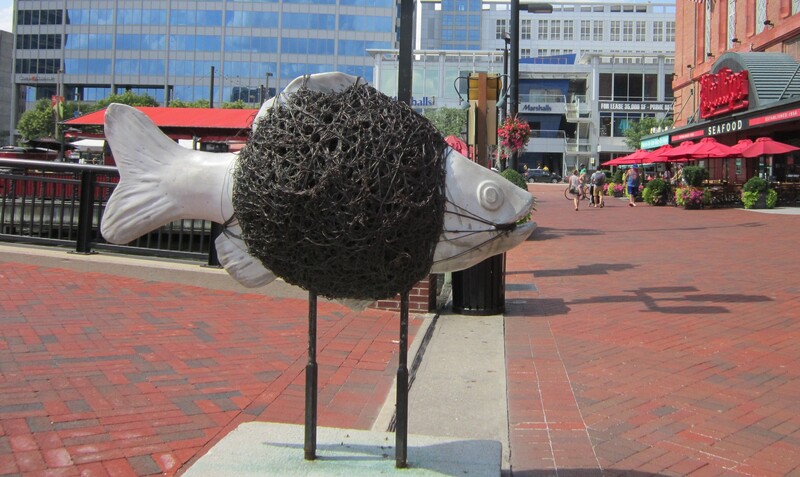 Anonymous fish sculpture. In the distance at right is Phillips Seafood, one of several upscale east-coast locations owned by a major crab processing company. They were priced far beyond our budget. 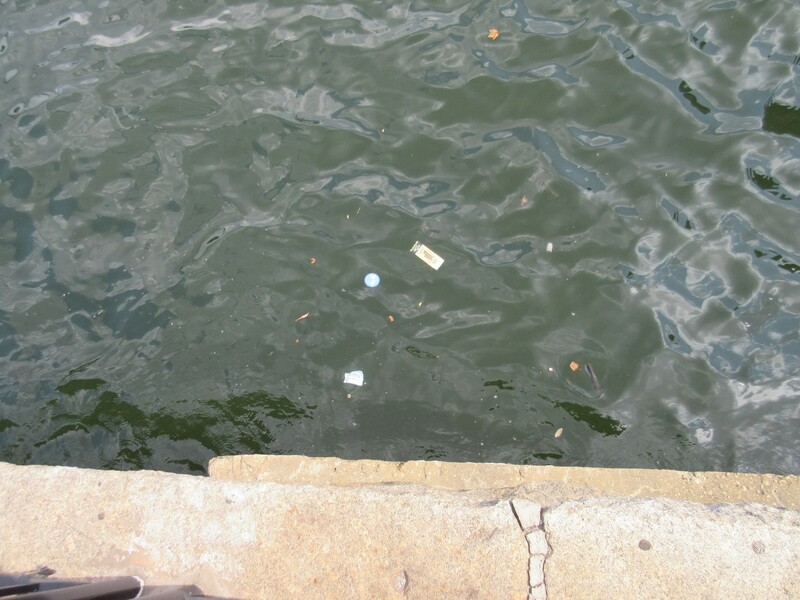 …we do not recommend looking directly into the water. 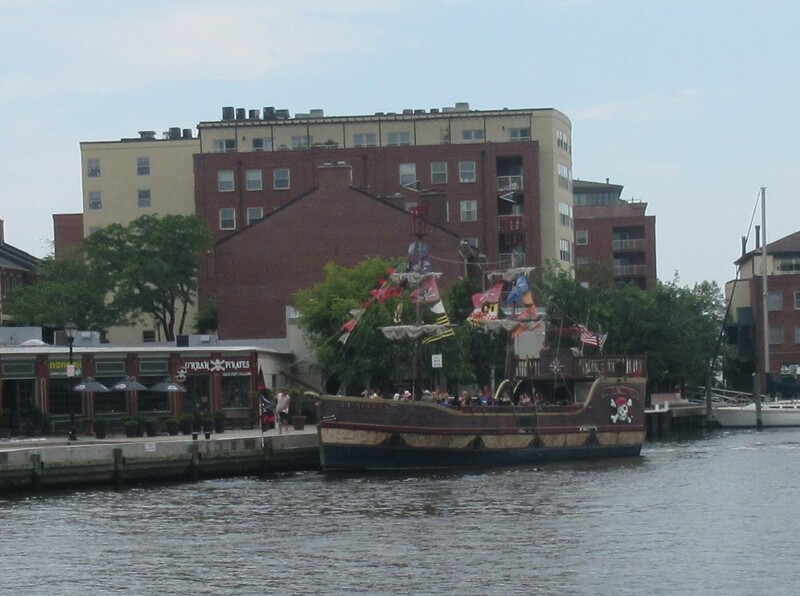 Another Inner Harbor feature is pirate ships. You too can sail for a few hours in historically compromised re-enactments of murderous looters and pillagers who later convinced the world they’re actually lovable scalawags. Pirate-themed attractions stopped being a draw for us after our awful incident in Wisconsin Dells. 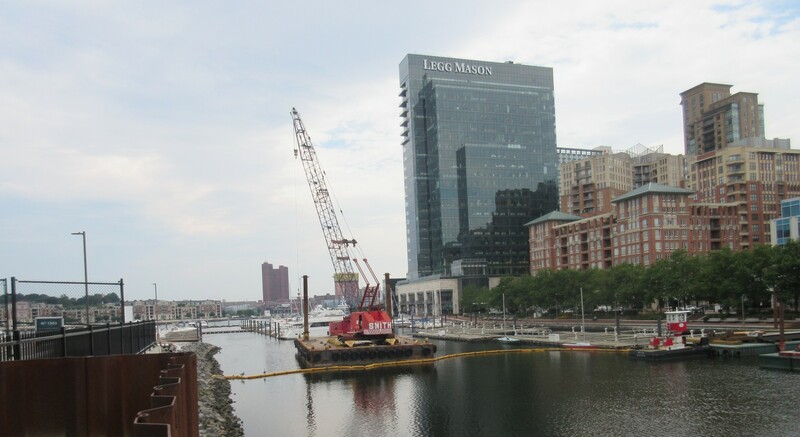 Our long walk from Fells Point back to the hotel on Day Five took us into a heavy construction area that gave us extra twists and turns to navigate. Along with these outtakes, there was also that one time on one of our Inner Harbor rides when we could hear a sort of traffic monitor yelling over the water taxi radio at some ship called the Black Widow that was zooming around at 15 knots where the speed limit is 6 knots. 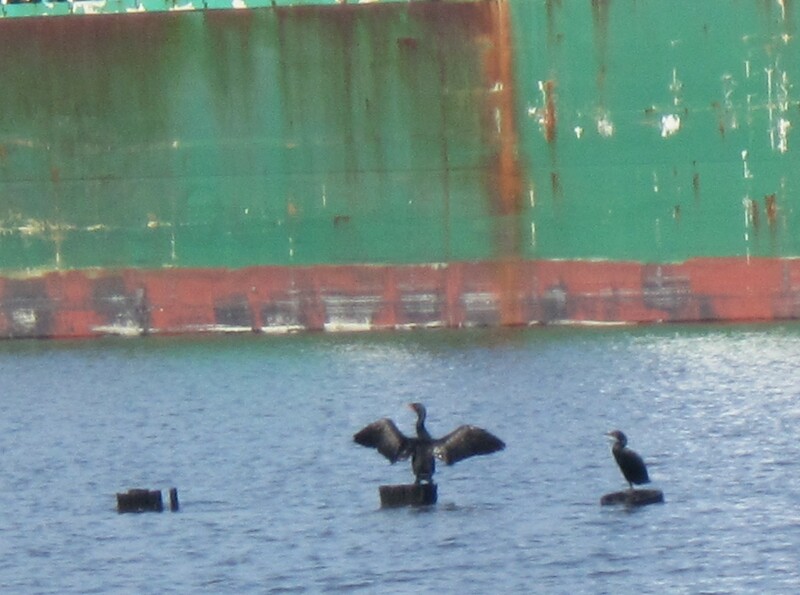 The monitor was none too pleased that she had to keep repeating herself at the offending captain. And there was another water taxi moment on the way to Fort McHenry when we chatted with a fellow passenger, a woman from Chicago traveling alone for fun. Who knows the odds of driving this far from home only to run into someone who lives three hours away from us. After that conversation, I wrote the phrase “American identity” in my notes. I wish I knew what I meant by that.